GRETCHEN TRIES STUFF EPISODE 10: The one with essential oils, lotions, serums & more! Throughout a large chunk of my life, I’ve been pretty lazy about my beauty routine. 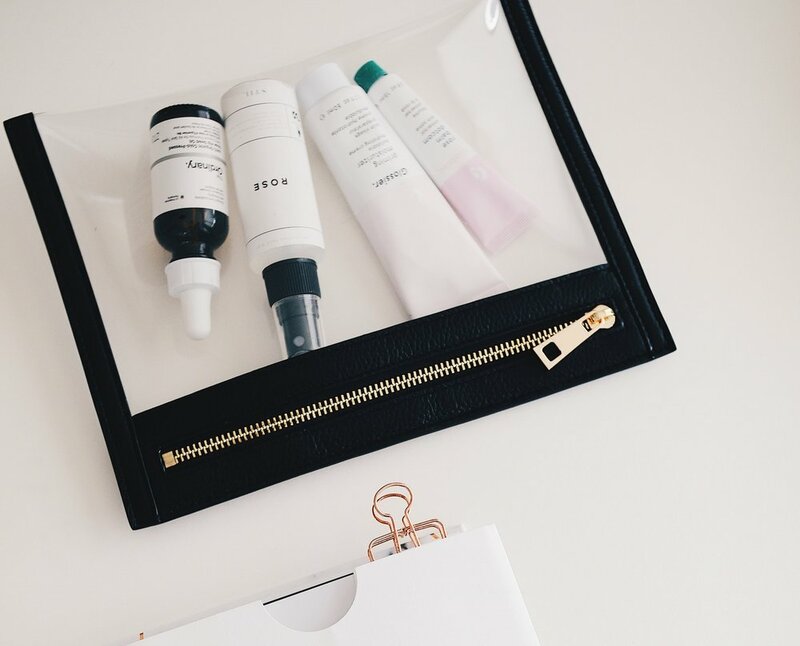 Until recently, the most makeup I typically wore was tinted sunscreen, I had no idea what a serum was, and I rarely actually washed my face (splash of water seemed good enough…right?). This lazy beauty routine worked well for me for most of my 20s, but unfortunately, this would not last forever. One beautiful spring day (about two and a half years ago), I switched to a new body wash in one of my absolute favorite scents: Jasmin. No more than 24 hours later, I notice a small rash on my right arm. It quickly spread. all. over. my. body! Assuming it was a reaction to something in the body wash, I decided to make a switch to more natural products. I started using a minimalist bar soap (an olive oil-based soap with only three ingredients), made my own shampoo and conditioner, and bought Jojoba and Tea Tree oil for the first time ever (they’re both naturally suppose to help with skin issues). It was my first time using essential oils. I’d leave my shower smelling vaguely like a koala who’s been binge eating salads, but if this is what it would take to keep my skin nice, it’d be worth it. Turns out I actually have a rarer form of psoriasis—an auto-immune disorder where your immune system starts attacking your body’s largest organ, your skin. So, I could have totally skipped what I now dub my “koala phase.” But something good did come from all of it: I discovered the benefits of using a bit of Tea Tree oil on my face in place of harsher acne treatments (bonus tip: unlike some of the other acids used to treat acne, Tea Tree oil won’t stain your pillow case if you apply it right before bed.) The over all experience also forced me to start putting more thought into how I treated my skin, which would become necessary within the next year. By the end of that summer, I moved to China for work. For most of my life I was lucky to have pretty minimal acne, but after little time living in China, it was a whole new ball game. It wasn’t super horrible acne, but it was constant and the most I’d experienced so far in life. My skin was not a fan of the air, or the food, or any other number of things that could have been causing my skin to freak out. When I moved backed stateside I was super hopeful my skin would go back to normal. Nope! It got worse (I guess it’s common to go through a period of really bad acne while you’re skin gets rid of the toxins it absorbed from the pollution in the Chinese air). While my skin isn’t nearly as bad as it was after I got back from China, it never felt the same from the whole experience. Once a week I also like to “treat myself” to a face mask. I really love The Face Shop’s Animal Masks (I brought home a suitcase full of them from South Korea) but I also like Glossier’s Moisturizing Moon Mask. It leaves my skin feeling delightfully soft, particularly when harsher winter weather is taking a toll. I apply a lotion and serum (I tend to combine them) in the morning and after washing my face at night. Some people use serum to replace lotion, and that works okay for me in summer, but in the winter I really need the extra hydration from the face lotion. I’ve been using the same base-lotion for years now because I love it. A lot. I use YesTo Cucumber Face Lotion and The Ordinary Niacinamide + Zinc Serum. I can typically pick up The Ordinary products for anything from $5-$10, so it’s pretty affordable. I’ve used three of their products so far, and the Niacinamide + Zinc is the what works best for me. Pro Tip: Don’t forget your neck when applying lotion. You won’t regret it later. Essential Oils before bed. I always have Tea Tree and Rose Hip oils on hand. Tea Tree is really nice for acne and rose hip is great for redness. I usually apply them before my face lotion when needed. Taking a makeup break. A couple times a week I like to give my face a break from wearing a full face of makeup. This could be either removing my makeup earlier in the evening or going a full weekend day without it, just to give my skin some time to breath, be natural, and not feel clogged up with foundation. Always, always wear sunscreen. I put sunscreen on when I’m getting ready in the morning even if it isn’t sunny out. You should also be reapplying sunscreen before you go outside (multiple times a day, because as magical as it would be to just put it on once, sunscreen doesn’t protect you all day long with only one application).